If you think that sock yarn should strictly be used for knitting socks, then sit down because I'm about to blow your mind. As it turns out, sock yarn can be used for a variety of different projects, including delicate shawls. Thanks to the creative mind of knitwear designer and author Jen Lucas, you'll be able to use up your sock yarn to create lacy shawls that are perfect for warmer weather. As you delve deeper into the book, you'll notice that each pattern is truly a work of art. Cleverly designed with lace detailing, eye-catching color combinations and beautiful textures, you'll be dying to get started casting on the moment you see the photography. In addition to stunning patterns, you'll also find great tips for choosing the right yarn, how to pick the right knitting tools and tricks for making shawls bigger! If you're not familiar with knitting charts, this book graciously provides written out instructions in addition to charts. 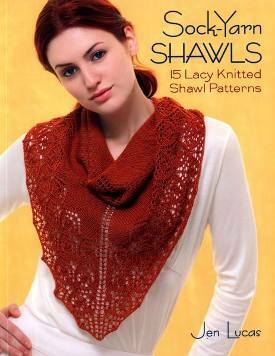 No matter how you prefer to knit, you'll love the classy patterns featured in this collection of shawls.